No more dirty bathtubs, hairy towels, sore backs, and torn shower curtains. Its easy and convenient. We give you everything you need for a clean good smelling dog. To make an appointment call 570-251-3470. We provide a private room with a walk-in tub, clean towels, shampoo, apron, and a blow drier. 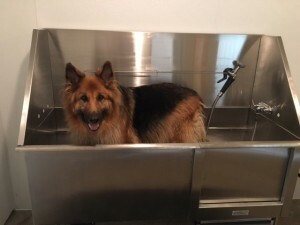 Pet Central is committed to ensuring the cleanliness of our wash stations and will ensure the tub is clean and sanitized with fresh towels prior to your appointment. Muzzles, special grooming tools and other optional equipment is sold in the store. 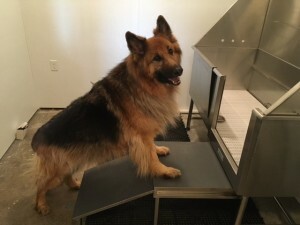 Hair cutting is not allowed in the Pet wash.
Pet wash is for general bathing purposes and is not intended to treat unusual or severe medical conditions or infestations. All animals will be inspected before being admitted to the pet wash. Pet Central reserves the right to refuse service if the condition of the animal is not suitable for the pet wash.